Police in Germany have uncovered a 45-ton tank, a torpedo, and other illegal weaponry dating back to WWII in the cellar of a villa in Heikendorf. As reported in Spiegel Online, officials were alerted to the weapons cache by Berlin prosecutors who searched the home a month ago looking for stolen Nazi art. 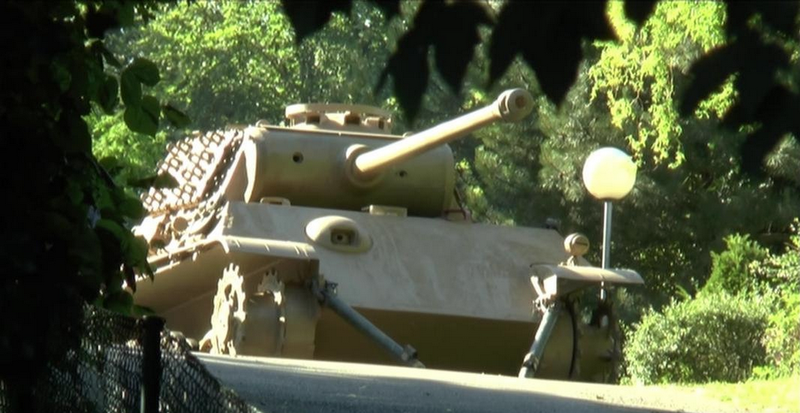 The subsequent search of the cellar uncovered a 45-ton Panther tank dating back to 1943, a flak cannon, a torpedo, and other WWII-era military weapons. The unnamed homeowner, aged 78, is now being investigated for potentially violating German weapons laws. According to his lawyer, however, the weapons were demilitarized and cannot fire, so they shouldn’t be in contravention of the War Weapons Control Act. Alternately, the man could be charged with collecting or trading Nazi memorabilia. The town’s mayor noted that the owner even drove the tank around decades ago. His neighbor Kristin Schroeder told the local Kieler Nachrichten newspaper a similar story, saying that in the 1970s he used it to help plow snow. NDR reported that the man’s property is rather reclusive, located off a private road with a concrete wall and barbed wire protecting it from beach access. It took about nine hours to remove the tank from the property. You can watch a video of the removal here. Top image: NDR video; torpedo image: NDR video; police image via DPA.